Udforsk en af ​​de historiske slotte udenfor Paris med denne halvdagsudflugt til Vaux-le-Vicomte. Tag RER-toget fra Paris 'Gare de l'Est til Verneuil L'Etang, hvorfra en lokal transport bringer dig til slottet. Lær om Nicolas Fouquet, for hvem slottet og haverne blev bygget i det 17. århundrede. 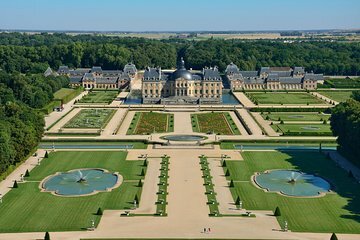 It was an interesting place, well worth the trip, with carriages the family used, lots of outbuilings we couldn't go into, and of course, in the winter, the famous gardens were bare, tho still well demarcated with hedges. I had a receipt on my phone to show to get in, but they wanted to charge me for the recording one takes to each station to hear the info in ones native tongue. I thought that was included, but I couldn't get internet there, hence the list of what was included. The lady called, and was told it wasn't included. It would be nice if that was listed on the receipt, or whatever it was on the phone that let them know I'd paid. I think the Xmas decorations were a hindrance to really seeing the castle, and really weren't that spectacular. The trip, we were told, was about 4 and a half hours, but by the time you get to the train station, onto the shuttle, see the castle, etc, It's more like six.